Cursing can be a distraction at work. 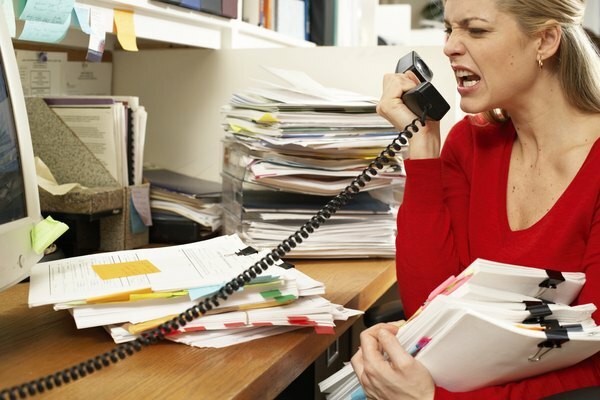 Cursing can be upsetting in the workplace, especially if it's extreme or continuous. Some workers use foul language as humor to get a rise out of their co-workers. Even prime time television shows and adult-oriented cartoons about the workplace use foul language to attract viewers. Other workers use swear words to belittle, dominate and intimidate co-workers, which is never appropriate. If cursing in your workplace is extreme, offensive or inappropriate, you need to take action. Talk to the co-worker about her offensive language. 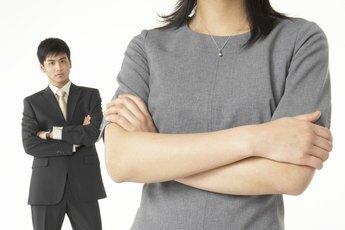 If you have a relationship with her, even if it's somewhat formal, let her know that cursing in the workplace bothers you. To avoid sounding overly sensitive, phrase your complaint in a way that's honest and straightforward, without letting your emotions run the conversation. Say something such as, "Maybe we could tone down on the language. I'm afraid one of our clients might hear you." Or, "Could you control your language? It's a bit extreme and distracts me from my work." If the swearing didn't improve after the face-to-face discussion, talk to your boss. You don't want to be viewed as a tattle-tale, so approach the topic as professionally as possible. Let your boss know that the cursing is extreme and you're afraid it might negatively affect clients, other co-workers and overall productivity levels. According to "Bloomberg Businessweek," employers often view cursing employees unfavorably and see them as less professional, mature and disciplined, when compared to employees who don't swear. Tell your boss specific foul phrases the co-worker used if they're sexist, prejudicial, hateful or degrading; otherwise, talk about the foul language in general terms. You don't want to give your boss an earful since she might be sensitive to cursing too. Consider documenting the number of swear words a co-worker uses in a given time period, so you can back up why it's so upsetting. Avoid social interactions and casual conversations with employees who's cursing habits upset you. You may have to interact with them during meetings and group projects, but you don't have to shoot the breeze at the water cooler or in the break room. Try not to overreact if a co-worker says a swear word from time to time -- infrequent expletives aren't something to stress over. Send the swearing co-worker a strong signal that you don't like extreme foul language. When she tells a distasteful joke, uses vulgar language or recites a story filled with swear words, let disapproval show on your face. You can even dismiss yourself and walk away. On the other hand, give positive signals by laughing at appropriate comments and tasteful jokes. You don't want co-workers to think you're overly sensitive or an old fuddy-duddy. According to "Entrepreneur" magazine, employees may have different feelings about swearing depending on age, religious beliefs, personal values and gender. As a result, others may not get as upset as you do about cursing at work.